There are few things more awkward than walking the streets of East Harlem in my Army dress blue uniform. The gold pant stripes and the medals on my coat draw an interesting array of reactions. Some offer suspicious stares. Some preach to me their conspiracy-theory wisdom about the current wars. About once a week, someone asks where the closest crosstown M60 stop is, thinking I'm a bus driver. At one point in America's history, an able-bodied young man walking these streets without a uniform  or at least a military posture  was the anomaly in town. I like to think it was a time when someone like me felt a little less alone in a corporate jungle like Manhattan. Perhaps it's naive to yearn for such empathy, but then again, it may be exactly what our nation needs in these troubled times. There are over 2 million Iraq and Afghanistan war veterans in the U.S. today; that number will likely double in the next few years as we wring ourselves of foreign obligations. While the numbers of homeless veterans, wounded veterans and veterans without health care in this country are all disconcerting, the statistic that continues to anger me the most is that among young American veterans  those under age 30  approximately 24% are unemployed, over double the rate for the general population. What infuriates me even more is the charitable pitch this nation uses to try to solve this complex problem. 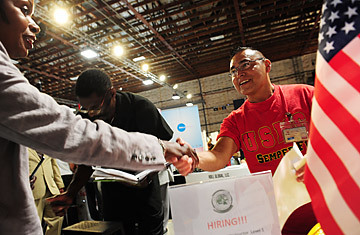 It's a common story: the mass media confirm the staggering veteran unemployment rate. Talking heads cry foul because we service members have "sacrificed so much" and we "deserve better." Of course, the viewers sigh and shake their heads with sympathy as they would if they were watching a commercial for the Christian Children's Fund  we all feel sorry for the kids, but in a tough economic environment, most aren't in a position to affect the situation. I spent a year of my life sitting down with Afghan tribal elders in the Kandahar deserts, trying to use any leverage I could to get them invested in a democratically elected local government, despite its being riddled with corruption and controlled by opposing tribes. I didn't use a sob story about democracy to get their buy-in. I used compelling leverages and incentives to convince the elders of their vested interest in their government's prolonged success. If there is one thing I've learned about the human condition from my tour in Kandahar, it's that when you pitch something like a charity, it gets treated like a charity. If you pitch it like an investment, it gets treated like an investment. If we really want to initiate action on veteran unemployment, we need to change the discussion from a charitable approach to a utilitarian one. This isn't an issue of honoring veterans or thanking us for our service. This is about the mass productivity and long-term national security of the country. The challenge is convincing business leaders of the added benefits of employing veterans, and politicians of the potential security consequences if it doesn't happen. The national-security pitch is straightforward. George Washington said it best: "The willingness with which our young people are likely to serve in any war, no matter how justified, shall be directly proportional to how they perceive the veterans of earlier wars were treated and appreciated by their nation." This isn't just theory to me. I see it every day as I travel the country talking about my experiences in Afghanistan and West Point. No matter how many "Army Strong" advertisements they see each day, there is no sight more influential in a student's decision to enlist than the waiting line at a veterans' homeless shelter or the Army combat-uniform-pattern backpacks lingering in the unemployment office. Veteran unemployment is a force divider. It compels our brightest and toughest youth out of military service and into careers they sense can support a family over the long term. But talking to employers about the benefits of hiring veterans is a harder sell. Some veterans' advocates assert that our troops are the most dedicated workers in the country, that the added productivity of employing a battle-hardened service member makes hiring veterans worth the outreach. If this were really the case, we wouldn't be fighting an uphill battle in veteran hiring. The reality is that reviews of veteran performance are mixed. Plenty of service members  particularly those with technical specialties  find employment easily upon leaving the service and advance beyond their civilian counterparts. However, the untold story is that of the combat-veteran staff sergeant with no college degree who led an infantry squad through a year at war. Though he's lucky enough to find an entry-level blue collar job, after numerous deployments, his family life is torn. He misses his unit. He misses the adrenaline and the Army culture he's known his entire professional life. His new job doesn't have the responsibility or personal initiative of combat leadership. His work ethic and focus slip, and it's the employer who picks up the tab ... and learns a sobering lesson about hiring veterans in the future. But there is hope for that staff sergeant  and his employer  with the President's new Veterans' Job Initiative, which will offer tax incentives for hiring unemployed and service-disabled veterans. It's a great first step to fixing problem, but its future in the legislative budget quagmire remains unclear. Many who support veterans are planning on contacting our lawmakers to urge them to pass the measure. But portraying service members as victims will not sway votes. For veterans to compete with prioritized programs like Medicare, Social Security and defense spending, we must internalize a modern argument for why veteran programs exist. We must show the valuable role veterans play in our national security. When the battlefield changes, so must our maneuvers. Or else, images of troops bearing economic battle wounds from their service will wade in the minds of our nations' youth. And our front lines will be weaker for it. Srinivasan is a spokesperson for Iraq and Afghanistan Veterans of America. He served as a Stryker platoon leader in the Kandahar province of Afghanistan from 2009 to 2010. He hails from Roanoke, Va.
See photos of an army town coping with PTSD.